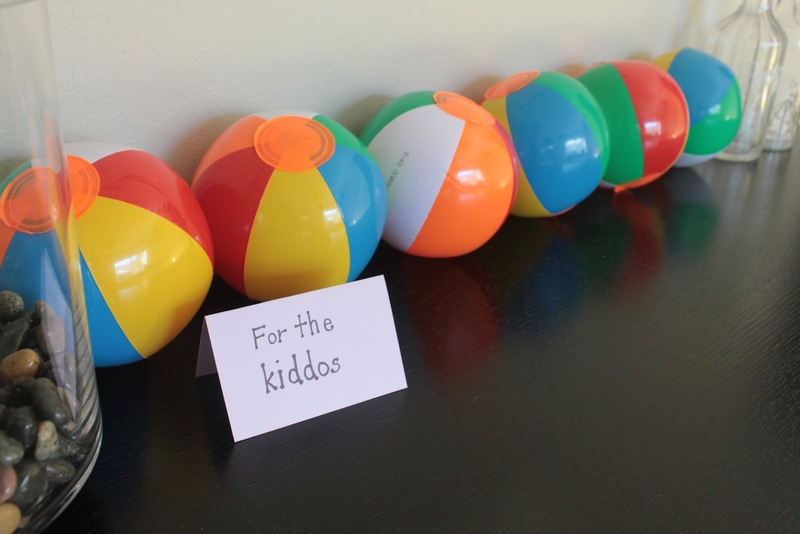 After little man’s first birthday, we found ourselves needing a better way to organize his toys. What a lucky boy he was (and continues to be) with all the new things he has to play with. 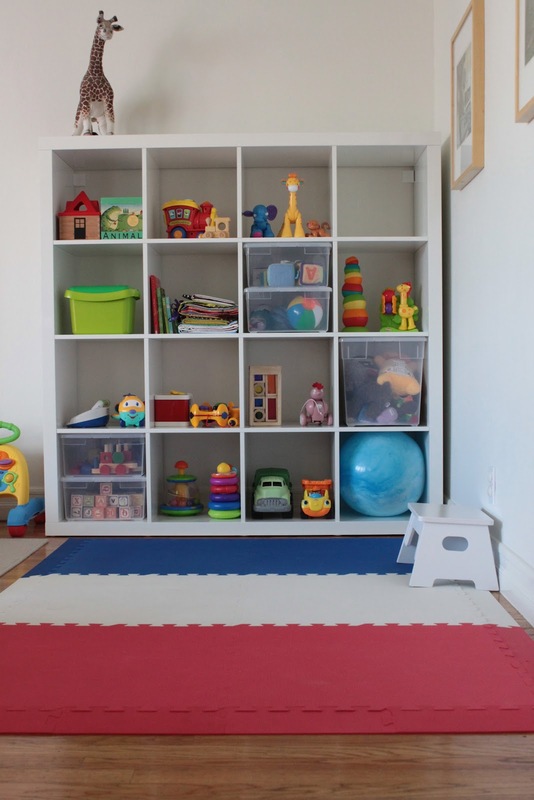 But, our single fabric bin to store all his toys just wasn’t going to cut it anymore. See how things were before? A mess!! 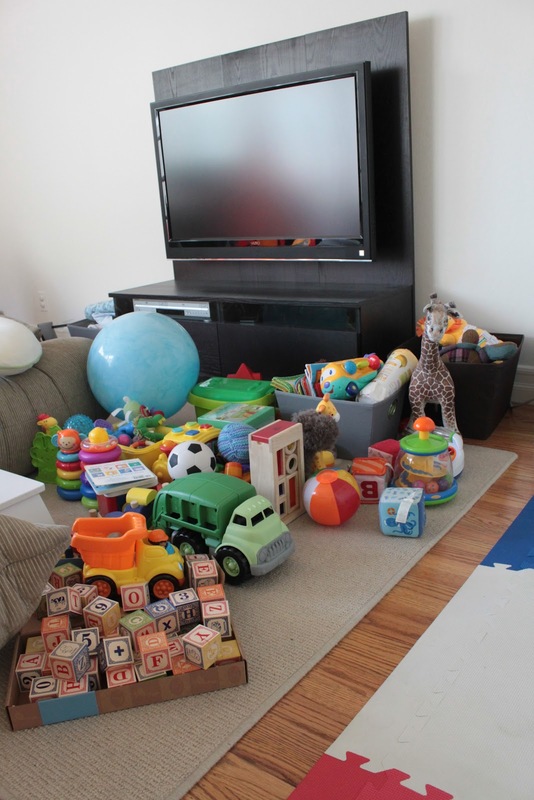 And with two parents who hate clutter, this mess wouldn’t last for long. 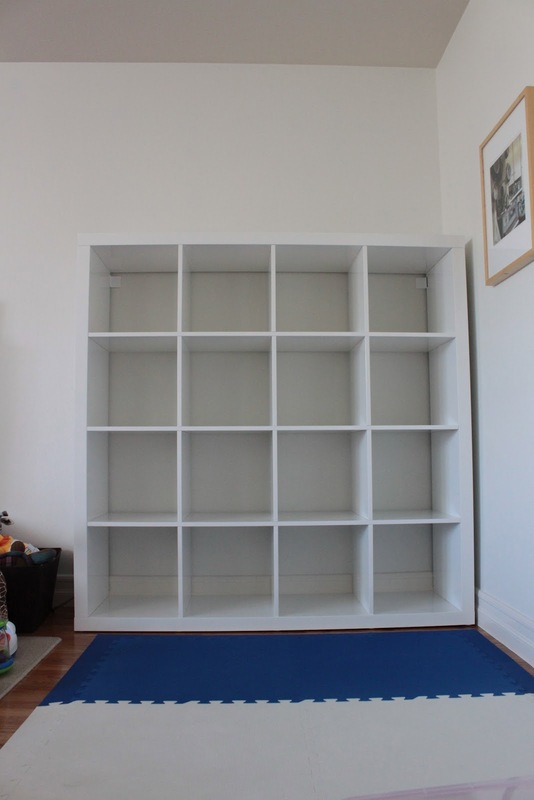 We ended up deciding on the Expedit shelving from IKEA. They have many different combinations of cubes available, but we settled on a 4×4 cube shelf. I was hoping to find some clear plastic boxes (“totes” as my husband likes to call them) that would fit in the cubes, so that he can see what’s inside and point to the box he wants to play with. I figured I would have a hard time finding the perfect box. Turns out, we already had them in the house! The clear plastic bins from the Container Store fit perfectly! See the two on the bottom left? Those are two of their “sweater boxes.” And the one on the right is a “deep sweater box.” I’m really happy with how this turned out, and little man seems to like it too! He points to what he wants if he can’t get to it himself, and he’s already able to start to participating in cleaning up his toys. Win win! This entry was posted in home improvment, kids on September 12, 2012 by seedsowingmama. Pinterest, how do I love thee? Let me count the ways. I’ve gotten so many great ideas from pinterest. We kind of had a love-hate relationship going on while I was planning little man’s birthday party. There are just too many great ideas and I wanted to do them ALL. I did manage to do many of them, and then asked my friend to kindly slap me if I decided to attempt so many pins again next year. Now that I’ve had a few weeks to recover from the party, pinterest and I are back on speaking terms. There are so many more pins to complete on my list! 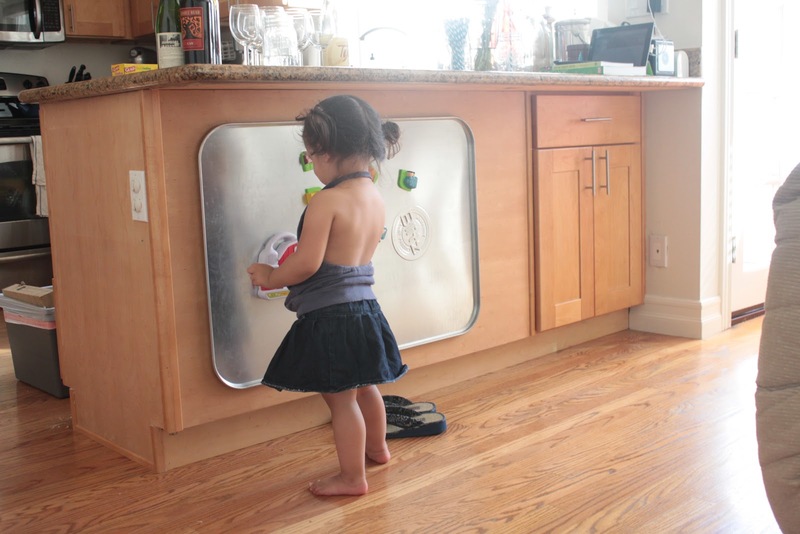 When I came across this pin, I knew there would be a drip pan magnet board in our future. We have a stainless steel refrigerator, which means it’s not magnetized. Same thing with our dishwasher. I thought it was too bad that little man wouldn’t be able to play with letter magnets, but figured he would overcome this first world problem and learn his letters anyway. Well, now he’ll be able to play with letter magnets (and other magnets) galore. The drip pan pin links to a blog post on Nic and Kate. 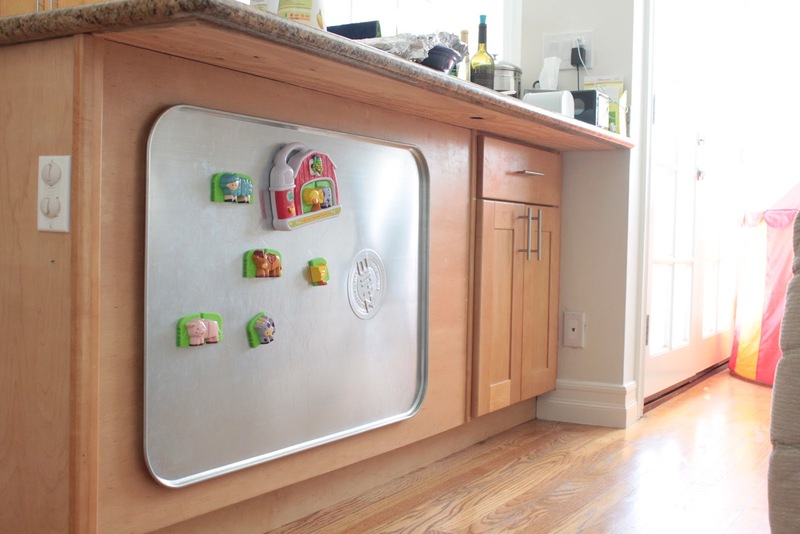 The blog post pictures an alphabet board on a drip pan, which is a really cool idea for doing matching games with magnetic letters. But, my little guy is not quite to alphabet matching yet, so I figured we’d just leave those off and use the drip pan alone. We bought the drip pan at Auto Zone for about $10. We took it outside to give it a good scrub and rinse before mounting it because it was a bit greasy. Not as greasy as I expected after reading Nic & Kate, but greasy enough for a good cleaning. Trevor used 3M adhesive strips to mount the drip pan to the back of our counter without putting any holes in the drip pan (or the wood). He used about 8 strips to make sure it was secure. Here it is mounted and ready for play! A friend’s 2.5 year old daughter, also having fun with the magnets. I was so glad to see little man will be able to grow with this! We eventually want to get the leap frog alphabet letters for him, but for now he’s loving the leap frog farm animals he got from a friend for his birthday. This entry was posted in DIY project, kids, pinterest on July 22, 2012 by seedsowingmama. 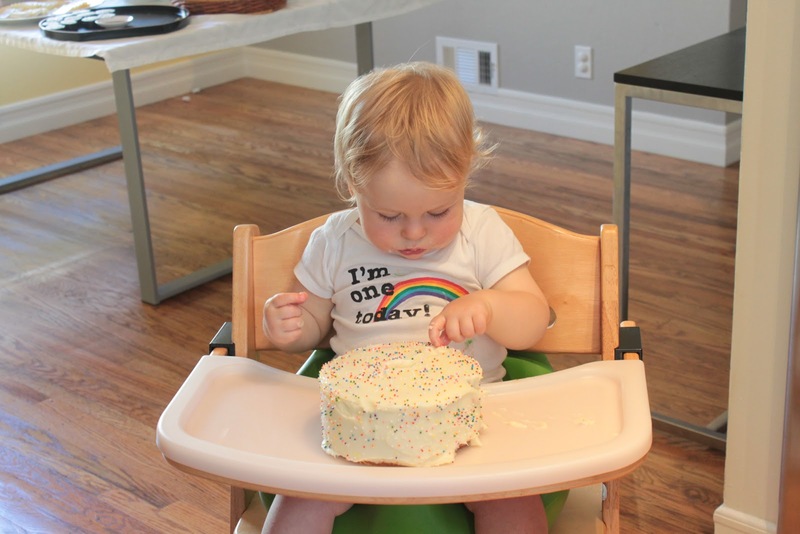 A rainbow-themed first birthday party! 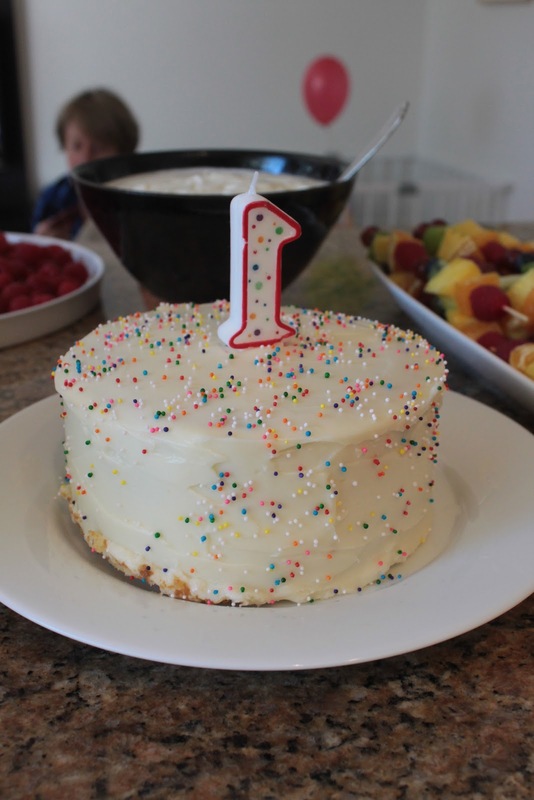 Yesterday was a long-anticipated day for our family- our son’s first birthday party! Marking the end of our first year as parents, we felt, needed to be done right. So months ago I set out searching pinterest for ideas. 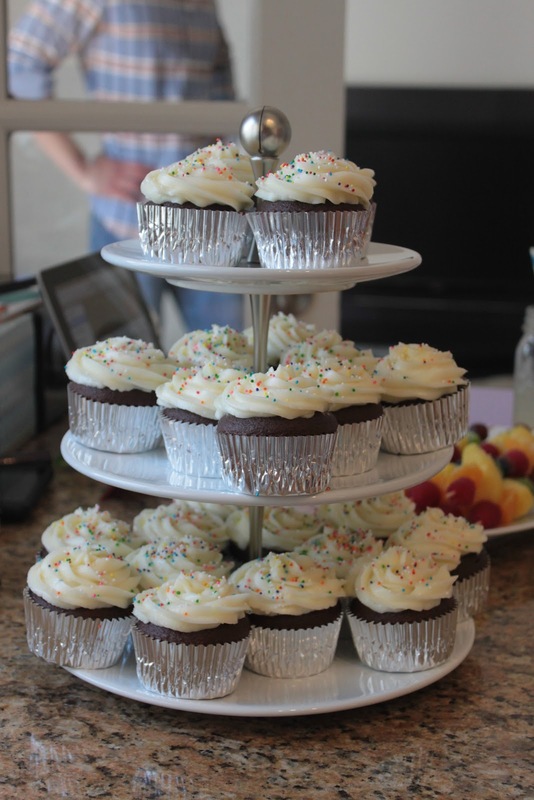 Pinterest and I quickly developed a love-hate relationship, as I could not say no to all any of the cute decor and food ideas, but I felt completely in over my head. Luckily, with my trusty excel spreadsheet (along with some very helpful friends and family members) we made it, and I couldn’t have hoped for it to come together any better. 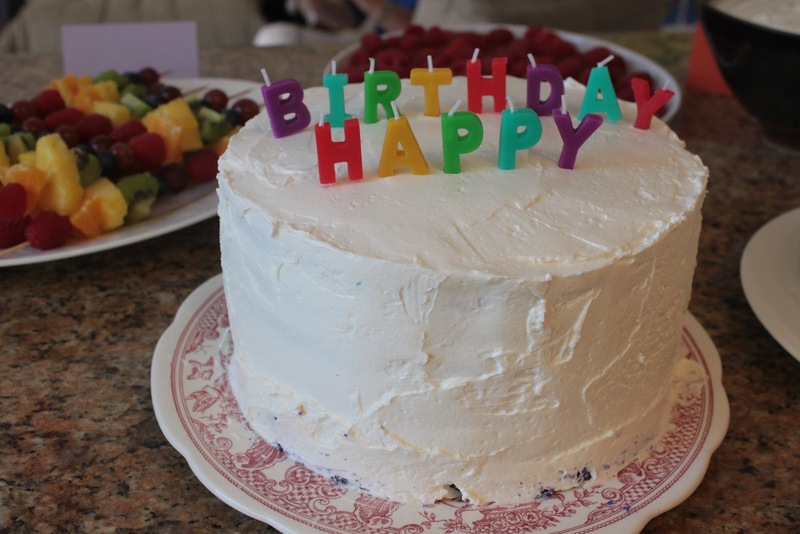 Of course, the people who were there to celebrate with us were really the ones who made the day special. 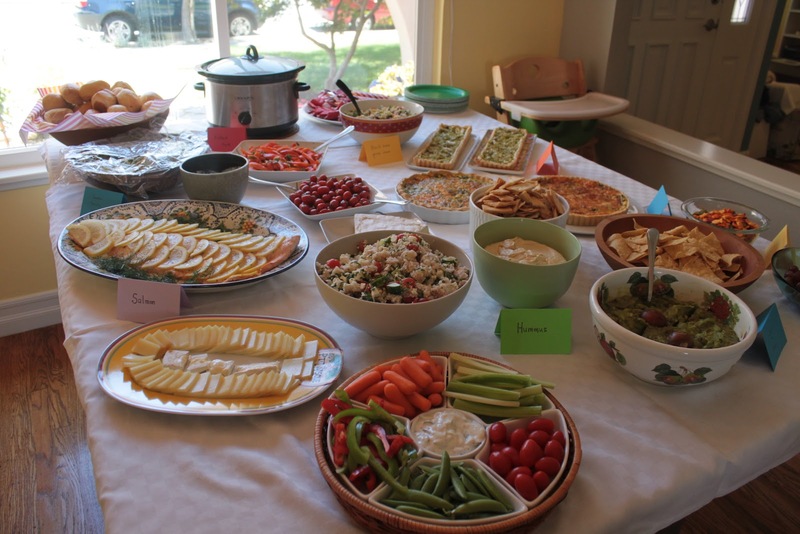 But I loved the liveliness that the food and decorations brought. If you can’t tell from the pictures, we had a rainbow theme going. Here is the banner I made with little man’s monthly photos. This is what people saw when they first walked in. 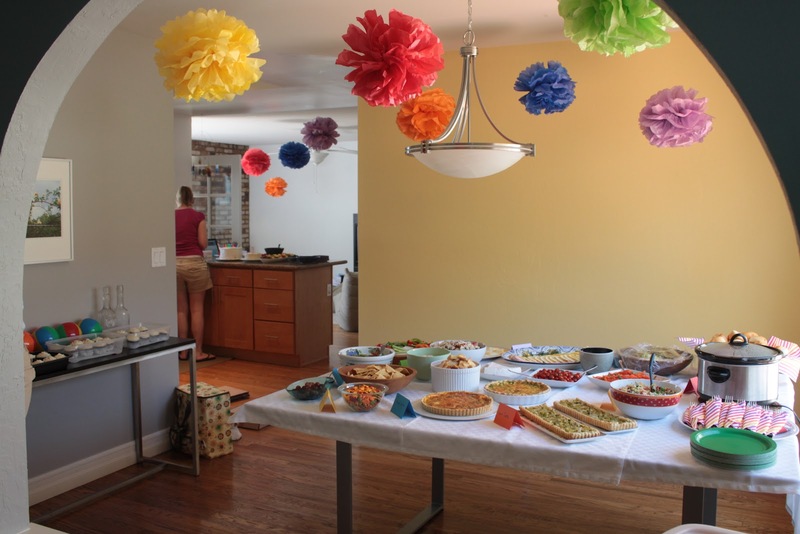 I made rainbow-colored tissue paper pom poms that were hung around the house. The idea for the pom poms came from this pin. The spread of food. All made by my mom and me. 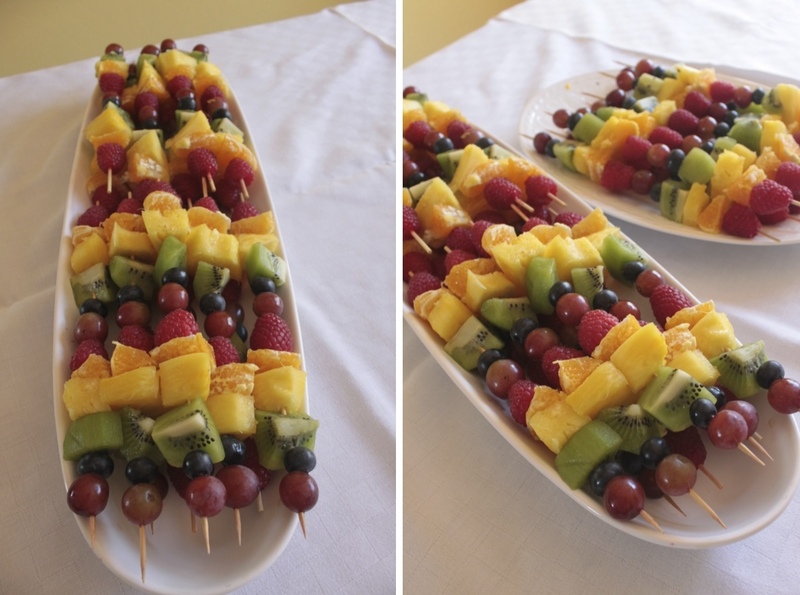 Rainbow fruit kebabs. The idea was from this pin. Little man’s smash cake. I realized later that I took a picture with the “1” backwards. Whoops! 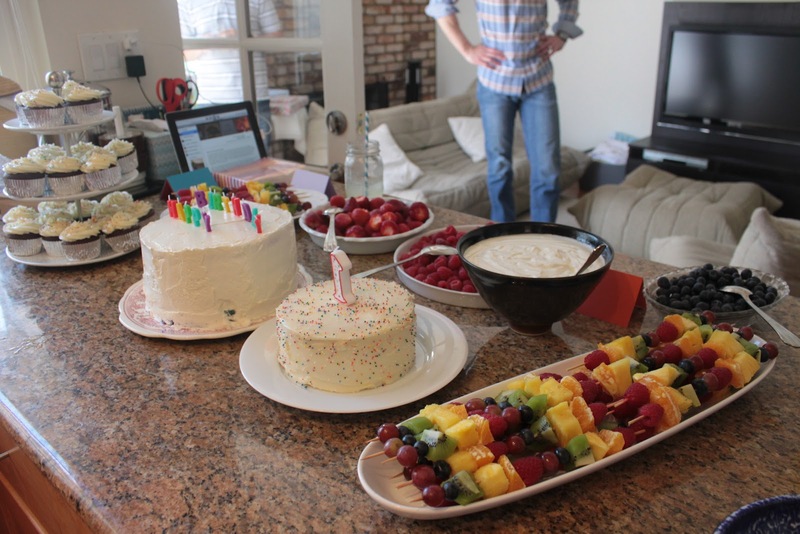 All the desserts together. I also made fromage blanc (the white yogurt-like stuff in the bowl). That’ll be it’s own post someday soon. My very first rainbow cake!! I was nervous about it, but I actually pulled it off! The effect was so vibrant and beautiful. I loved it. 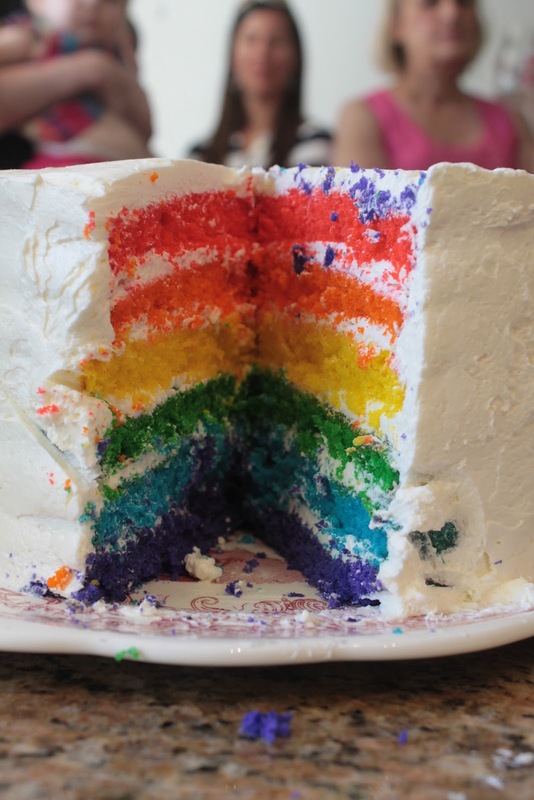 The recipe is from Whisk Kid, who’s now-famous rainbow cake recipe is on Martha Stewart! In case you’re concerned about the waste involved in making the tissue paper pom poms, I already posted them on freecycle and someone is picking them up on Monday for their daughter’s birthday party. I love that someone else will enjoy them! Also, if you’re wondering about the cost of that much tissue paper, I got most of it at the dollar store. I think we spent a total of $10 on tissue paper. Not too shabby. AND, in much more exciting news than tissue paper prices, little man took his first steps after the birthday party! His 10 month old friend came back over after her nap to keep the party going. She surprised us all and took her first steps! I guess little man decided he didn’t want to be shown up by his younger friend, so he followed suit soon after. He really is growing up! This entry was posted in baby-related, baking, DIY project, kids, pinterest on July 2, 2012 by seedsowingmama.